And it doesn’t matter if you’re in a relationship or not. When I was single I used to hate Valentine’s Day as I would feel lonely. I remember how hard it felt on a day that’s marketed to couples. So today I wanted to create something that shows my love for you. And also something special that is all about loving yourself. Today, and every day from this day forward, I want you to show yourself love. Loving yourself means caring about your health, and nourishing it with nutrient dense food. Do you love yourself enough to take care of yourself? That is the question I really want you to ask yourself today. It’s a tough question for a lot of people – because unfortunately the answer, a lot of the time is… no I don’t. So I would like today to be a day of reflection for you. Really dig deep today and ask yourself what is holding you back from great health. There will definitely be a reason. Write it down on a piece of paper, and when you identify the reason, write an affirmation to yourself that is the opposite of the reason why you don’t value your health. ‘Even though I have had my fair share of struggles, I now choose to love myself, to become the best version of myself that I can be. I choose health, I choose life and I will take daily action and do whatever it takes to have good health and energy’. ‘I have great health. Every day I feel full of energy. I make great food choices that nourish my body and help me stay at my ideal weight. I care deeply about myself and value every second of my life’. Even if you don’t believe it right now – I want you to start saying it every day. After a short while, you’ll notice yourself making different choices because you are literally creating a brand new person by telling yourself a new story every day. 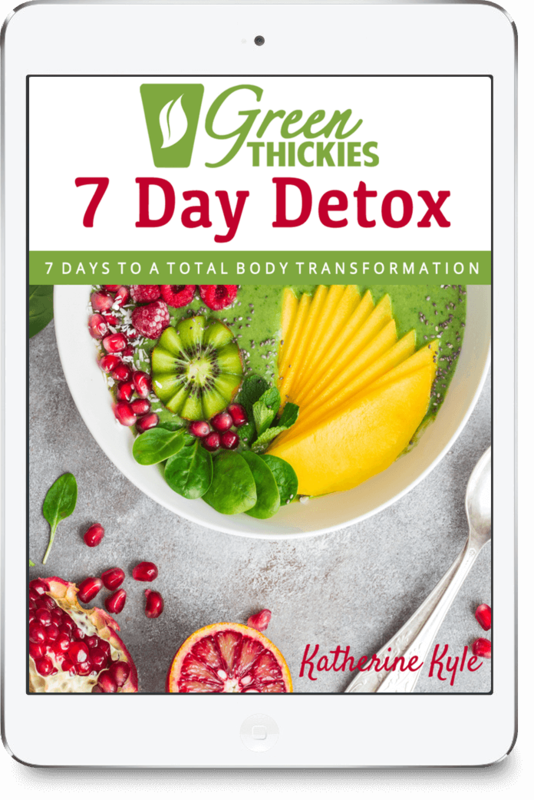 Before long you’ll have the health and the body you never believed could be yours. OK great – so now that we’ve discovered how to change our mindset so we can actually love ourselves. What does someone who loves themselves eat? 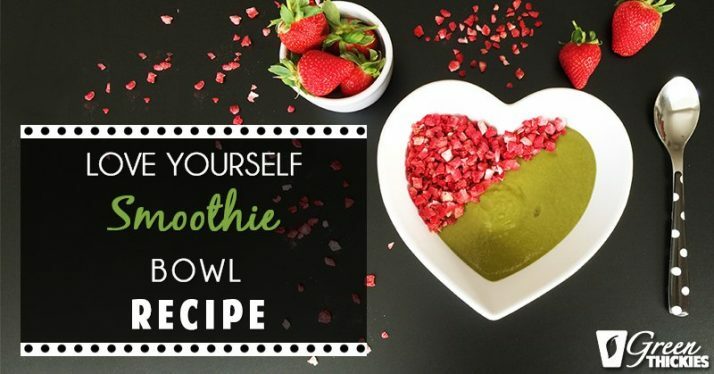 A ‘Love Yourself Smoothie Bowl’. I created this with love for you. I love it and I’m pretty sure you will too. Not only is it tasty, but it looks SO pretty. Why should we make smoothie bowls? The great thing about smoothie bowls is you get to sit down and indulge and eat a normal meal, instead of eating on the go the whole time. Some crunch and texture to chew. 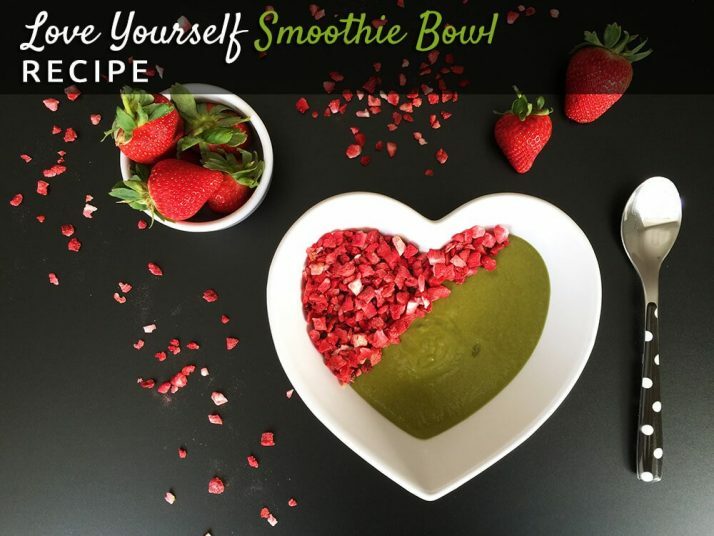 And not only that, you will enjoy this smoothie bowl a lot more because they say most of the taste is in the presentation. We taste with our eyes! So if you make your food look beautiful it will taste even better too. 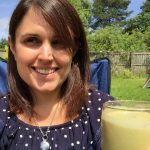 Optional extras: Fruit, nuts or seeds for layering on top of the smoothie. I used ¼ cup of freeze dried strawberry pieces. But you could use chopped up fruit or any ingredients you already have. To cool your smoothie bowl, replace 1 cup of water with ice or use frozen fruit or leafy greens (make sure your blender can handle frozen fruit). I like to use frozen fruit to save peeling and chopping. 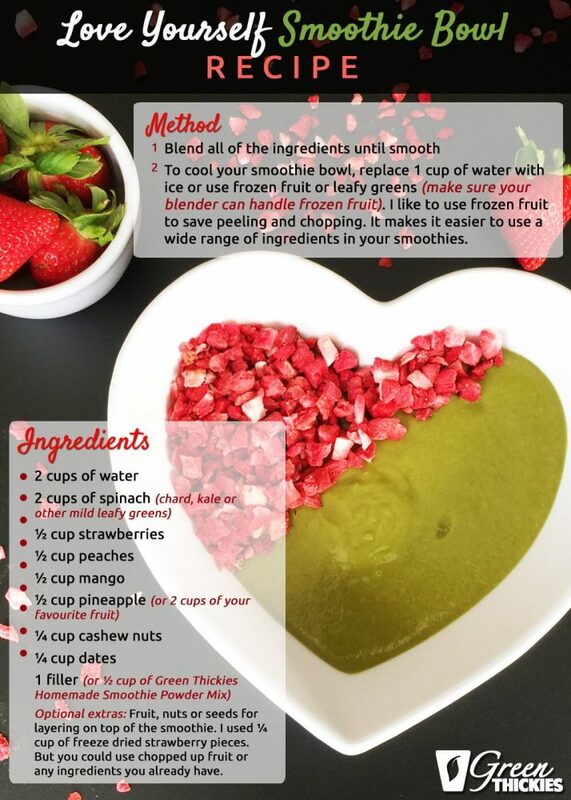 It makes it easier to use a wide range of ingredients in your smoothies. In case you were wondering where I got my heart shaped smoothie bowl, I bought it from Amazon.co.uk. You can see it here. If you are in the US – this is the closest heart shaped bowl I could find. Click here. This smoothie bowl recipe is actually a ‘Green Thickie’ recipe which means it is a complete meal. 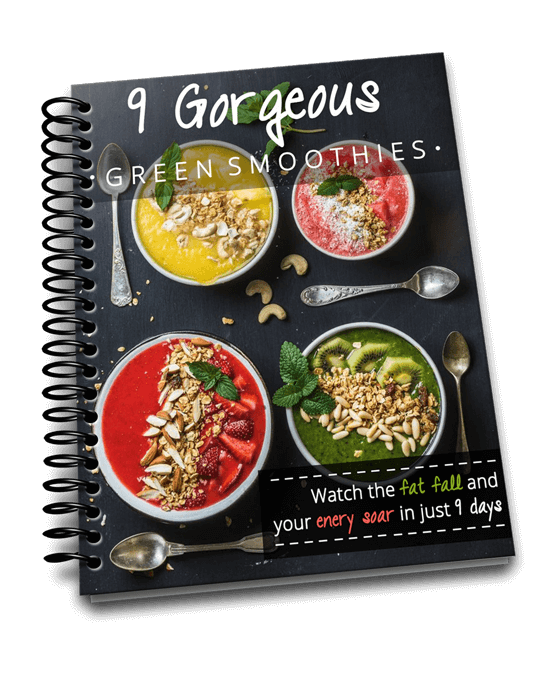 If you would like more Green Thickies recipes, please click here to get my 9 Gorgeous Green Smoothies recipes.